Available now for only $5 on the MIDIbox Shop! 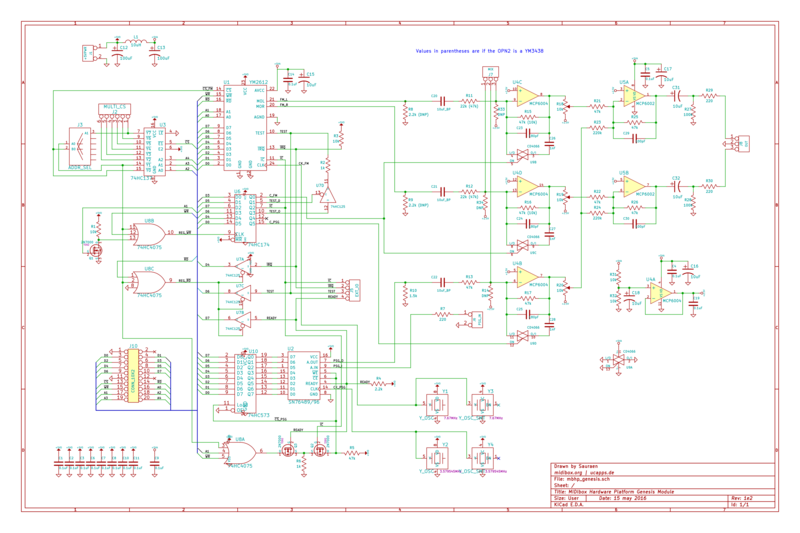 Most of this is really easy to read off the schematic, but here you go anyway. +5V power input to the module. 1 +5VD 5V supply to board. The “D” stands for “digital”, in comparison to the +5VA net which is the supply for all analog circuitry. 2 GND Ground. Common to analog and digital. Not connected to the mounting holes. Chip-select lines generated by the decoder on the first board, for the sound chips on the other three boards. On board 1, stuff U3 and its bypass capacitor C3, but don't connect anything in J3. On board 2, don't stuff U3 or C3, but connect two wires on the top of the board, one from U3:13 to J3:2, and one from U3:12 to J3:1. They should follow the first two angled lines on the footprint for J3 under U3. On board 3, same thing but connect U3:11 to J3:2 and U3:10 to J3:1. These two wires should follow the second set of lines on the board, the non-angled ones. On board 4, same thing but connect U3:9 to J3:2 and J3:3 to J3:1. These two wires should follow the last pair of lines on the board, angled in the opposite direction. The overall effect is that the eight signals from the decoder are distributed in pairs to each of the boards. J3:2 and J3:1 are connected to U3:15 and U3:14, so on the first board the decoder drives the two /CS lines directly. For those who prefer to have separate wires from the module to the core for the additional signals to/from the sound chips, rather than using the parallel interface to read/write them, this header brings them out. 1 /IC YM2612/3438 reset signal. Don't drive this pin externally if U6 is stuffed! 2 /IRQ YM2612/3438 interrupt request signal. Goes low when one of the OPN2 timers overflows if configured approrpriately. 3 TEST YM2612/3438 Test signal. See Notes about the YM2612's Test pin. 4 Ready SN76489/94/96 Ready signal. Also called /BUSY. Goes high when the chip is ready to receive new data. Audio input to the PSG's analog audio input pin, if the PSG used is a SN76494 or SN76496. 1 – Audio input. See the PSG's datasheet, and choose the value of R7 accordingly. These are the three nodes where the audio signals from the different boards' YM2612 and PSG channels are mixed. The three pins correspond to the summing node of an inverting amplifier with first-order low-pass filter. These are three-pin headers to connect potentiometers to adjust the relative volume (and panning if desired) of the OPN2 and PSG. As is obvious from the schematic, R18 is for OPN2 Left, R19 is for OPN2 Right, and R20 is for PSG. The potentiometer is 10k nominal (will work fine with 5k or 2k), audio type (A) preferred but not required. It is intended that a dual-gang potentiometer would be used to adjust the OPN2 levels together, and a separate single one for the PSG. If panning is desired, after the level potentiometers, connect a 20k or 50k potentiometer between the Left output and Right output (R18:2 and R19:2) with its wiper connected to +2.5V (R18:1). Analog audio output from all the modules together. Low-impedance output, referenced to ground. Parallel address and data busses between MCU and module. Pins 1 through 10 connect to J11A on the core and pins 11 through 20 connect to J11B. Mouser part numbers are included for convenience, all parts (besides the two sound chips) are standard and should be available at any electronics site (e.g. Reichelt). Parts labeled “buy in bulk” should already be in your electronics inventory; they are of course available at Mouser and elsewhere if you don't have any, but you should probably buy many more than are necessary for this project (e.g. resistors in sets of 100 or 200 of the same value from eBay). 1 Y1 or Y3 7.67 MHz (or 8 MHz) oscillator 774-MXO45HS-3C-8.0 Oscillator (either half-size/8-DIP or 5x7mm SMD) at desired OPN2 frequency. MIDIbox Genesis firmware will correct frequencies to match original VGM pitch, but if this is your own project, careful selection and/or custom clock circuitry may be necessary. 1 Y2 or Y4 3.58 MHz (or 4 MHz) oscillator 520-TCH357-X Oscillator (either half-size/8-DIP or 5x7mm SMD) at desired PSG frequency. MIDIbox Genesis firmware will correct frequencies to match original VGM pitch. 3 Q1, Q2, Q3 2N7000 or BS170 821-TSM2N7000KC821-T or 512-BS170 Any small-signal N-channel MOSFET with the gate as the center pin; the board silkscreen is for 2N7000, if you use BS170 (as I did) mount them backwards to match the source and drain pins. - J1, J2, J7, J10 0.1” stackable pin socket/headers 782-A000086 Pin sockets with long pins (from Arduino shields), for stacking the boards together. Buy in bulk and combine them for the appropriate sizes. Use a regular pin header for the lowest board in the stack; have each header mounted with the socket below the board and the pins sticking out the top. See this photo of the stack. - J5, J6, J8 0.1“ pin headers Buy in bulk Headers; J5 and J6 are individual on each board if used, and J8 is only on the final board. Previously I had a section here about the different use cases and what values of resistors to use for R11 through R17. But since I've finished the hardware for two MIDIbox Quad Genesises, one with four YM2612s and one with four YM3438s, I think the values are pretty much final at this point. I have not tested extreme cases for clipping (e.g. all four YM3438s in DAC Override mode playing peak-to-peak samples), but my calculations based on measurements of normal audio suggest that even this won't clip (though to be honest, I'm not sure if clipping in that situation would be a bad thing). The values I used for my quad builds are on the schematic and in the parts list. The normal values are for use with YM2612s, and the values in parentheses are the ones to use with YM3438s. All other parts which just show one value are the same on both builds. Here is a chart of what components should be stuffed on each build configuration I could think of. In most cases, several of these build configurations will be active at the same time (e.g. in a typical four-board setup, the top board is A, B or C, D, (E), F, G, H, I, M. Note that MIDIbox Quad Genesis requires F, G, H, I). For the PSG chips, the relevant differences are obvious: use the correct clock speed for the chip, and do or don't connect an audio input. It's much easier to find 4 MHz (or 3.58 MHz) oscillators for the '89 and '96 than a 500 kHz oscillator for the '94, so you're a bit on your own if you choose that chip. For the OPN2 chips, the YM3438 is a complete reimplementation of the YM2612 in CMOS instead of NMOS. They also changed the output stage to get rid of some analog error in the YM2612's DAC, which produces a distinctive “ladder effect” sound in the audio output, as well as making the output about 10-20dB louder (which also produces excellent signal-to-noise performance). FM synthesis purists might be inclined to choose the YM3438; retro gaming fans will probably go with the YM2612, as this is the physical chip used in the Mega Drive / Genesis Model 1. The differences for this module are relatively simple. For a YM2612, the audio outputs require a known load to perform to spec–these are R8 and R9. The value of 2.2k was taken from the Mega Amp design, but some experimentation may be warranted. For a YM3438, no load is necessary (don't stuff R8 and R9), but it's loud enough that it may clip when four are mixed together. Also you may want to reduce the volume if you have two YM3438s and two YM2612s. This is set by the relative sizes of R11, R33, and R15 on the left channel, and R12, R34, and R16 on the right. /CS, /RD, and /WR are all 1. A4:0 and D7:0 are -. Set the data direction of D7:0 on the MCU to outputs. Write the write data to D7:0. Set MCU data port pins to output mode. If the write is to the OPN2, wait a little over 6 OPN2 clocks. If the write is to the PSG latch or local register (OPN2 /IC, Test, Caps), wait about 50ns (propagation delay of all onboard logic). Set MCU data port pins to input mode. Set the data direction of D7:0 on the MCU to inputs. For the OPN2, repeat the above for the data write. Write A4:0 to MN0– if the write was OPN2, or MN1–if the write was PSG. From reading photomicrographs of the YM2612 die and further related hacking work, it has been confirmed that this is an I/O pin, not just an output. Hence the MBHP_Genesis module contains circuitry to both read and write the pin on each YM2612 independently, as well as to select the pin direction. If the pin is mistakenly configured as an input (so the module drives it) while the YM2612 is also driving it, a protection resistor R2 allows the YM2612 to override the state of the line without damage to either device. When appropriately configured as such via bits in the test registers discovered by Sauraen, the Test pin outputs a SYNC signal–a pulse for one of the 24 operators in the cycle. Using this pulse to know when to start and putting the OPN2 in a particular test mode, MIDIbox Quad Genesis periodically reads out the state of all 24 operators, and measures the average volume of the operator for the VU meter display on the front panel.